“Callista” was the word that started the Trojan War. Eris, the goddess of strife, was angry that she was not invited to the wedding of Peleus and Thetis. Everybody else from Olympus was there. Eris inscribed “Callistae” – the dative form of the word, which meant “to the fairest” – onto a golden apple and rolled it into the banquet hall. Naturally, all of the big three celebrity goddesses claimed the apple. Zeus – this must be why he got to be Zeus, the most high – didn’t get sucked into making the decision. Zeus told Hermes to bring the ladies to Prince Paris of Troy, who was known for his taste in women. The Judgment of Paris would settle the impossible issue. Aphrodite, goddess of love; Hera, wife of Zeus; and Athena, goddess of wisdom, played the bachelorettes. It was no evening gown or swimsuit competition that they held, up there on Mount Ida. The girls did their K-Street best to sway him. Athena promised Paris strength and knowledge. Hera promised wealth and power. Aphrodite promised that he’d marry the world’s most beautiful woman. Guess who won the golden “to the fairest” apple? 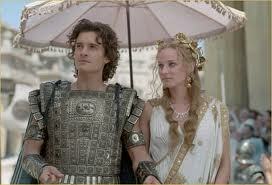 Problem was, that most beautiful woman, Helen, was already married to Menelaus, King of Sparta. Away she went, spirited off to become Helen of Troy. She was the one with “the face that launched a thousand ships;” they sailed off to get her back for her hubby. It was the original quagmire, taking ten years, but back she came to Sparta. Callista, Calista. And now you know the rest of the story. You are currently browsing the Veteranscribe's Blog blog archives for December, 2011.